1. What is a Golden Doodle? A Golden Doodle is a hybrid of a Golden Retriever and a Standard Poodle. This cross provides the best benefits of both breeds. Doodles provide a drastic difference in shedding, and sometimes almost no shedding. So families with allergy issues often can tolerate Doodles. Not to mention that Doodles can have very wavy to just slightly wavy hair that can be of the texture of a golden or of the soft silky hair of the poodle or anything in between! Their intelligence is above and beyond average as well. This is probably because of the high intelligence of the Golden Retriever and even higher more complex intelligence of the Poodle combined with the faster maturing traits of the Golden Retriever. Another benefit of Hybrid Vigor in that genetic defects that are common to specific breeds can not be replicated in a cross of two breeds. This provides a healthier puppy that will be free of some of the inherited defects that can come with specific single breeds. Its been known that they can be healthier and live longer than either of the breeds individually because of this benefit. But you don't have to take our word for it, do a search, you can see for yourself. Personality wise, if you've ever known a golden doodle then hands down you know what amazing dogs they are! If you don't know one, you definitely should! 2. What are the different types of Doodles? The "classic" type and original type of Golden Doodle is a 50%/50% cross from a breeding of a Golden Retriever x Standard Poodle. This is the "First Generation Golden Doodle." There can be some variation in the outcome of their puppies such as in coat type, shedding, and framing, but personality wise, they are pretty consistent. This puppy is the doodle that maximizes the benefits of both the friendly golden retrievers and intelligent poodle. The backcross type of Golden Doodle is a 75%/25% cross from a breeding of a goldendoodle with a poodle. This produces a puppy that has much more predictable qualities and leans more towards the poodle traits. The F1b x poodle is the ideal puppy for people who have allergies. This is the most hypoallergenic doodle. The coat is typically wavy to curly and is low to non-shedding. This is a backcross of an F1b to and F1. The purpose is to make a doodle with a balance in between the F1 and F1b. The result is a puppy who retains much of the 50/50 vigor but leans slightly more towards the poodle aspects. This is a great puppy for people who have mild to moderate allergies. We have not had this kind of litter yet but hope to in the near future! The Teddy Bear Golden Doodle comes from a breeding of an English Cream Golden Retriever xPoodle. English Cream Golden Retrievers are known for their great bloodlines of friendly but mellow personalities. Their smaller/boxy frames and faces make for adorable puppies that are usually cream to apricot in coloring and have great demeanors. This doodle is called the "Teddy Bear" doodle because they actually look like teddy bears! 3. What are the differences in coats? Framing: Varies, however many lines of Golden Retrievers tend to be more dominant. More likely to have Golden Retriever frame. Grooming: Varies, depends on coat type. Probably not much grooming, maybe every 3 months. May need to trim facial areas or afew wispy areas. Perfect For: Families with mild allergies or those looking for the most Golden Retriever looks in with the benefit of decreased shedding of a Golden Doodle. Even easier to train than Golden Retrievers! Allergies: Varies depending on coat, may have very minimal dander to no dander. Best for those with dander allergies to dogs. Good for families with moderate or strong allergies to dander. Framing: Varies. Will be the average size of a golden retriever and under the coat possibly slightly more slender. Perfect For: Families with dander allergies of moderate/strong or those looking for the most non-shedding Golden Doodle, or for the most wavy type of coat. Even easier to train than Golden Retrievers! 4. How much are your doodles? Our puppies range from $2300-3200 plus tax. 5. How do I reserve a puppy? To reserve a puppy, please go to our Available Puppies page and download the application. Fill it out and mail it in along with a $300 deposit (to be deducted from the final amount due on puppy pickup day). Please read all the information on that page as it will explain the application process and what it means. 6. What do you recommend for crates, food, vitamins, etc? Check out our recommendations on dog supplies on our resource page. 7. What do you recommend for dog training? In addition, we sometimes provide a one week Puppy Kindergarten program for our clients and other local reputable breeders. Finding a local certified obedience trainer in your area is also great once your puppy has been home with you for a few weeks. Obedience trainers can teach you how to best communicate with your dog as well as how to listen to your dog trying to communicate with you! 7. Can I see more pictures of your past puppies? Yes! 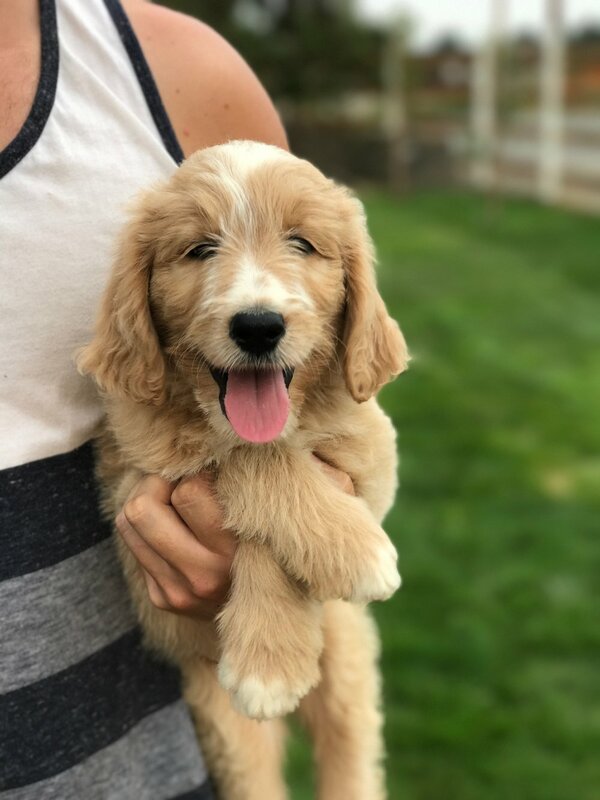 I LOVE taking pictures of our sweet puppies and you can find more pictures of what goes on around Evergreen Doodles on our Instagram page! You can click the link to see all of them but I've included the latest photos I've posted below. You can also follow the #evergreendoodles to see some of the pictures our past families have shared. To see some of our puppies grown up, you can also check out our testimonials page!